If you have a high mite drop (55-65 mites or more) during the 24 hour period, you have two choices. You can leave the hive alone and hope it does alright on its own (which it may), or you can pursue a natural treatment of some sort. You can try treating with essential oils like spearmint or lemongrass alone, or mix the essential oils with canola or vegetable oil. The theory is that the oils cover the bees and as they clean, they will spread the oils all over the beehive. Apparently the oils cause the mites to fall off, or as the bees clean themselves, they knock the mites off. I am also experimenting with essential oils for mite control. I have not encountered a bad mite problem in my hives yet, for which I am grateful! 🙂 If I did need to treat for mites, I would probably use powdered sugar. Many beekeepers have had good success with powdered sugar over the years. I know of several folks who swear by it, and it does seem to be a viable solution. Application is as follows: the beekeeper dusts the whole hive with a liberal application of powdered sugar. As the bees clean themselves, they remove the varroa mites as well. On a last note, don’t just copy my example without researching the various treatments available. You need to make the choice for yourself. Be an informed beekeeper. Make decisions based on your own research, not just on hearsay. Be able to stand up and say why you do what you do. This entry was posted in Beekeeping Advice, Hive Management, Questions Answered and tagged HowTo, natural beekeeping, treatments, Varroa Mites, Warre Hive. Bookmark the permalink. How do you apply the powdered sugar in a Warre’ hive? bejolino – You will need to open up the Warre Hive in order to apply the powdered sugar. (Horrors! We open the hive! :)) Dust it all over the bees and all over the comb, just as is recommended when dusting Langstroth hives. You want to try and get every bee covered in sugar. Work quickly, but gently and keep your movements smooth and even. Close the hive up when finished and don’t bother the bees until the honey harvest in late summer. How would an open mesh floor affect the hive? I am led to believe that in a natural habitat such as a tree there would be a degree of ventilation from the floor? Wayne – I think a mesh floor might be helpful for Varroa control, but I don’t know about trees and ventilation. It depends on the tree I suppose. I really don’t have an opinion on mesh floors. Solid floors have been working great for me for years. But who knows? I may try mesh floors next year. I don’t think the powdered sugar treatment would be very effective in a hive with a solid floor. All the sugar does is encourage the bees to groom a lot more, causing the mites to fall. A screened bottom board allows the mites to fall through to the ground. A solid floor would catch the mites, and then they’d hitch a ride on the bees entering the hive. In other words, they take a trip, but end up where they started from. I’ve seen two alternatives to screened bottom boards on line, a “sump” box under the hive, and entrances above the floor. My Langs have wintered well with screened bottom boards left open. I guess since warm air rises, there’s not much ventilation through the screen unless there’s an opening at the top for the warm air to escape through. Also, I live in Kentucky in zone 6. It may be a lot bigger issue where it gets really cold in the winter. Right now I have screened bottom boards on our two Warre hives, but I need to re-do them because the screen isn’t coarse enough. I’ll let you know how it goes. Thanks for everything, Nick! You’ve been a huge help to us as we start natural beekeeping. Hi everyone! Does anyone know where I could get plans to build my own screened bottom board for the Warre hive? There is one for sale at “The Warre Store.com” for $39.00 and they do not ship to Hawaii (where I am). It looks like a great design and my husband is a carpenter! We are trying to convert a farm in West Wales/Carmarthen, to be permaculture/organic and would love to keep bees – is there somewhere in our area we can learn more? Are varroa or CCD a problem here? They are high definition and give a good example of how a single person can easily dust multiple layer hives. Kerry Cox is the apiarist, and I recorded the video. I must say that as a novice around bees, I felt remarkably safe. Kerry kept the bees perfectly calm the entire time which which helped me tremendously. Comments on the videos are very welcome! I think a mesh floor is essential on a Warré, where your only other clues as to what is going on in the hive is whatever you can see at the entrance. Not only can you monitor mite drop, but you can see if you have a chalkbrood problem by the ‘mummies’ being dropped – I use a 1/4″ mesh with a sliding board under, all below a 3″ sump. Although the 1/4″ mesh allows bees to pass through, they never bother as there is no access to the outside. Has anyone tested with the powdered sugar blower? I have one and it does a good job of “coating” a langstroth hive – I intend to start a few Warre hives this coming spring as a research project. In Warre’s original plans, he was packing the top (above the quilt?) with pine needles, etc. I don’t see mention of this on your blog – though I may have missed it. Also, what prevents wasps, etc. from building nests in the top of the hive – under the roof? I may not navigate back to this site for a while. These are the most simple Screened Bottom Boards to build. I just finished six for my Warre hives and I am preparing to bulid about a dozen for my existing and future Lang splits. I have done a lot of looking at plans and these are the best! 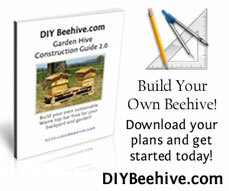 how do you build a warre and lang split hive? i am buying bees in a lang and want to convert to warre? any ideas? This is a great article. We have had success with powdered sugar. warres dont allow bees to tolerate more mites, most other beekeepers treat their bees to keep mites at a lower level. If you want to get your bees to work their way into a Warré, you definitely want them to work downwards, back-filling above them. Queens will not move upwards over honey stores to start a new brood nest. And I don’t see any evidence for Warré hives being able to tolerate more mites. David Heaf had heavy losses last winter. I generally concur with David’s comments, but I still see no evidence that Warrés are any more ‘mite tolerant’ than TBHs or other hives, for that matter. If you practice ‘hands-off’ beekeeping and allow bees to swarm, the ensuing brood break will take care of a lot of mites, regardless of the hive used. Some people have told me that they have had the same colony of bees in a Warré for 5, 6 even 7 years, which ‘proves’ that they tolerate mites, but what is really happening is that their hive swarms most years and re-queens itself in the process, while the mite population takes a dive because of the brood break. Not that there is anything wrong with this – it simply shows that if you do nothing – or virtually nothing – the bees can take care of themselves. It is the constant interference that conventional beekeepers indulge in that does the damage. Thanks Bioee, I agree and I do believe that mans constant interference play’s a big role but many conventional beekeepers split their hives which creates the brood break you mention and still have problems with mites. I think there’s more to the Warre that IMHO makes it more mite tolerant (better thermal control, under supering, natural comb) but that, of course, is just my personal opinion. I have read that treating with commercial powdered sugar is not good for the bees because it contains starch. One article even suggested making your own powdered sugar in a blender. Does anyone have any thoughts or experience about this. Thanks. Dear Nick, do You have any disigns or ideas how to connect the bicycle air pump to a powder contaner? What I am trying to do is to lift the hive using my lifter and to apply the powder from the bottom so that the “nursery” gets the treatment. I had purchased 7 hives and 6 of them died “thanks” to Varroa. To tell the truth I relied too much on the Warre design of the hives and powdered only once which appeared to be not enough. Perhaps, other factors were that the bees I had purchased were extremely gentle Cordovans – “flying worms” or maybe the colony needed time to adjust back to its original comb size. I am trying to find the condition when bees survive without my help or intervention and I open the hive only once in the late spring to take the upper box. Humans have hundreds of diseases, bees have just a few which I can count on my left hand, hence, after 150 million years only the very very strongest have survived. Also, have You heard about a remedy to protect the hive from the electromagnetic radiation from made by humans? ‘noticed the mistake in the last sentence. Again: “Let us not go against the laws of nature. Let us leave the germs to accomplish their mission, which is to get rid of what is useless, and let us give our bees the strength to fight against these microbes. We see strong men untouched by tuberculosis germs, whereas weak men often give them favourable conditions for development. All in spite of having encountered tuberculosis germs in public places, on trams, carriages etc., in equal measure. Bees must be similar to men. Since we know well that bees can be bred (and will ‘breed themselves) to be mite resistant, surely we must follow Warre in making that aim amongst out highest: putting the needs of the species and local population above the needs of our own hives, rather than perpetuating the vulnerability to mites that treatments of all kinds incur? Continuous selection for mite resistance brings out the bees natural defences, treatements represent the opposite – frustration of the natural path to health. This is the basis of all animal husbandry, and something Warre clearly understood well. Dear Mike, I used to think exactly like You, before 6 of my 7 strong hives developed from packages died in the first year. Interesting observation, though, the one that survived has an upper entrance not especially done for the bees but as a result of not perfect construction on the edge of the top box and bees use that entrance only due to the fact that it is closer to the brood. I conclude that, perhaps, the mites fell and there were no bees around to climb onto. Hence, what I did is, I made holes on each and every hive box and during the main nectar flow I will leave them open and the bees will use upper entrances, hence the mites will fall to where there are no bees. Plus I will use the holes on the hive boxes for sugar powdering without opening the hives. I will let everyone know if I succeed. I think that Warre is a method and not a hive. I hear about a Warre being more natural… Like maybe a square is more natural than a rectangle… I think a hollow log is more apt to be circular like a tree… A five frame deep nuc or an 8 frame medium have similar size areas per box, can be used with peaked roof, no foundation, top bars, supered underneath etc. Besides maybe you get tired of buying package bees and buy a nuc to perhaps manage the hive…. Thanks for the comments Harry, Warre is both a method and a hive, you should read the book if you have a chance it’s in the sidebar under the downloads section labeled “Beekeeping for All” by Emile Warre (PDF e-book, 9MB) V6. It’s an excellent starting point to understand this method of keeping bees. And yes, I think a big part of the problem we’re having right now is that newer keeps (and some seasoned) think that conditions within the hive should be perfect. As we all know nothing in nature is perfect and the bees are very capable of taking care of things on their own. Perhaps by doing nothing you do not notice ants in the hive and try to remove them… This could be a good thing…ants eat mites that drop… Ants also produce formic acid, the same stuff that is added in concentrated form to kill mites… Colony Collapse Disorder is thought to be caused by a perfect storm of factors including mites… By not feeding unnatural sugar water, not messing with the bees by switching frames spreading disease and disrupting them, more mites can possibly be tolerated… Besides a successful parasite does not kill the host! On the other hand I prefer to monitor my hives doing nothing unless absolutely necessary … If for instance American Foul Brood were present, I would want to burn the hive before robbing spread it to all my and my neighbors hives! Hi I’m Phoebe. I just got a Warre hive. I am needing to know in what way to make the essential oil available to the bees. I really like that idea for mites.